Hi everyone! I am almost done sharing my travels to Puerto Rico! I wish I could go back, right now! I am missing the adventure and spontaneity so bad. Check out day one & two, three, four, five, and six. Make sure to subscribe (link on the sidebar) to my blog to keep up with the latest! Day seven was quiet the adventure from day to night! For starters, you can not go to Puerto Rico and fully experience it without visiting the ONLY tropical rainforest in the United States. It is one of the most magical places and you could easily spend your whole day exploring, hiking, and enjoying the breathtaking views and fresh air. This day was full of adventure since the morning all the way until the night. We started our day in El Yunque, the rainforest. 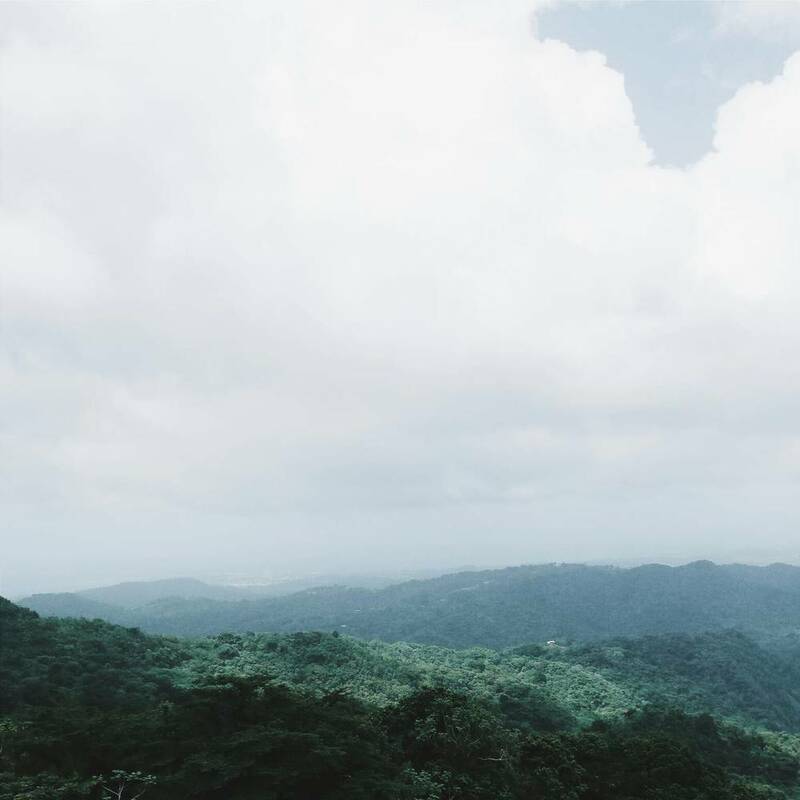 We climbed the Yokahu Observation Tower and caught some amazing views that take your breath away. You could see the city, the mountains, and the ocean. It was beautiful and so calming! The air up here in the mountains is so crisp and refreshing. Now to get up and down this mountain you need to pray that both cars fit on the road. Literally praying the whole way up and down, ha. We visited the ancient baths and decided not to hike to La Mina Falls because we were short on time, we will save that for next time. We then headed to Fajardo to continue our adventure for the night: kayaking in the bioluminescent bay!!! I have always wanted to see the bioluminescent bay in all of its glory. I never really believed that just by moving your hand in the water, it would glow like an electric blue Poweraid color, but seriously it did. Out of my family I was the only one who had ever been kayaking and I was pretty stoked. My mom doesn't swim well, so she was frantic and my dad has heart problems. Nonetheless, they are troopers because they completed it! My mom and dad partnered up, my little brother went alone, and my middle brother and I went on one together. COMMUNICATION AND RELATIONSHIPS were hella tested. Okay so let me explain. We had to kayak through the open ocean through boats and yachts that were docked in the middle of the ocean. That was the route to get to the canals that lead into the bay. Navigating through the ocean was the most excruciating thing I have done. The canals and bay were a breeze. We did the first "getting there" part in daylight. Now we returned in PITCH BLACK darkness! Literally we had to wait until the sunset to see the organisms glow, so naturally it was night when it was time to return. Our kayaks had one glowstick attacked to the front or back. LOL. Kayaking through mangroves in the obsolete darkness is a joke. Let me just say that it was better now knowing what was under your kayak then to try to figure out. On a level of 1-10 hardness, this was a 9 for sure! All you had as a guide was an occasional flashlight from your tour guide. Now you weren't the only group out there so kayakers would come and go and crash into you, since it was pitch black. The hardest part was navigating the rough high tide in the open ocean. I am surprised nobody crashed into a yacht. My brother and I had to play limbo with the anchor line, that was pretty interesting. Let me just say that when I touched land I was ecstatic! I learned so much from myself. Never give up and think less of yourself because you are capable of so much. Push yourself for greatness and never under evaluate anyone. I am so proud of my parents and brothers for doing this! Defiantly a once in a lifetime opportunity and I will NEVER forget this! It was extremely demanding but so rewarding. When everything went pitch black, the only thing you could see was the night sky. That was the most alive I had ever seen the skies and stars. I have to say that our tour guides were incredible and the best! If you ever want to do this, go with Pure Adventure Corp. When I go back I plan on going on a snorkeling tour with them. You will not be disappointed! I finally checked this off of my bucket list! YAY! Stay tune for day eight!